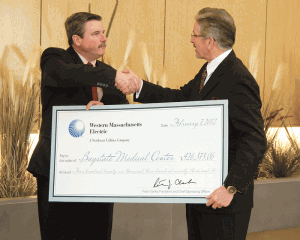 The $296 million expansion of Baystate Medical Center, opening in early March, promises to offer the latest in medical technology, patient care, and comfort. However, it represents the latest thinking in another area, too — energy efficiency in major building construction. Energy efficiency was a top priority for Baystate in conceiving, designing, and building the facility; architects and builders put in advanced cooling and heating systems, energy-efficient lighting, and a green roof to save on energy costs. In recognition of these efforts, Western Mass. 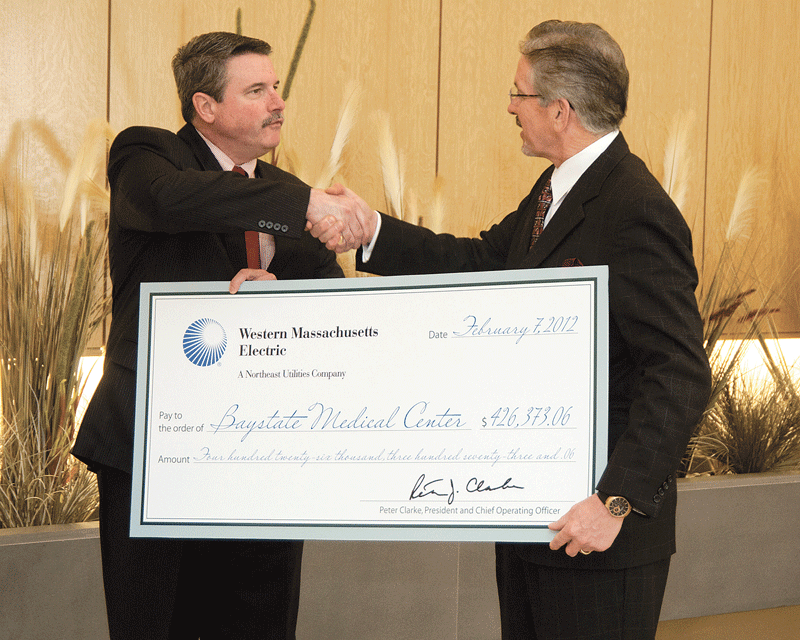 Electric Co. President and COO Peter Clarke, left, presented a $426,373 incentive check to Baystate CEO Mark Tolosky. This is the largest energy incentive awarded by WMECo for 2011. Thanks to Baystate’s commitment and WMECo’s support, these changes will save 3,282,269 kWh and about $459,000 in operating costs each year. 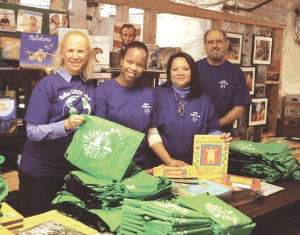 Hampden-based Rediker Software recently teamed up with the local nonprofit organization Link to Libraries as part of their Caring Community Project to assemble literacy book bags for children entering kindergarten in Holyoke and Springfield public schools. Pictured, from left, are Rediker Chief Financial Officer Gayle Rediker, Stacie Ann Walker, Ofelia Cruz, and David Tivoli. 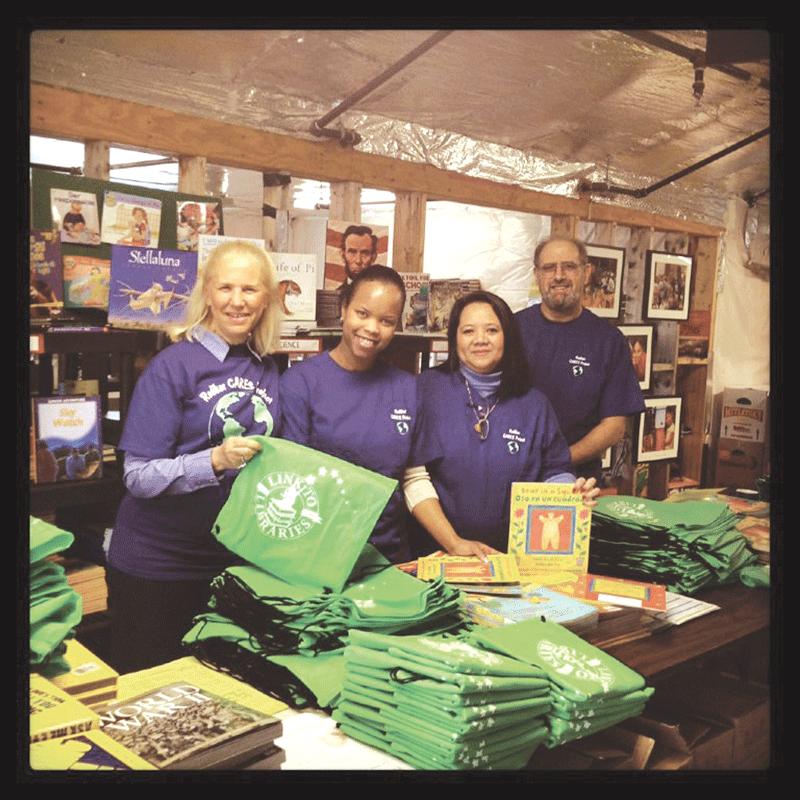 Link to Libraries has assembled more than 2,800 Welcome to Kindergarten literacy kits and donated more than 50,000 new books since the organization’s inception in 2008. Above, Susan Toner, vice president of Development at Baystate Health and executive director of the Baystate Health Foundation, speaks with Chris Kellogg, morning host of the Kellogg Krew on 94.7 WMAS, during the 94.7 WMAS Radiothon to benefit Baystate Children’s Hospital. 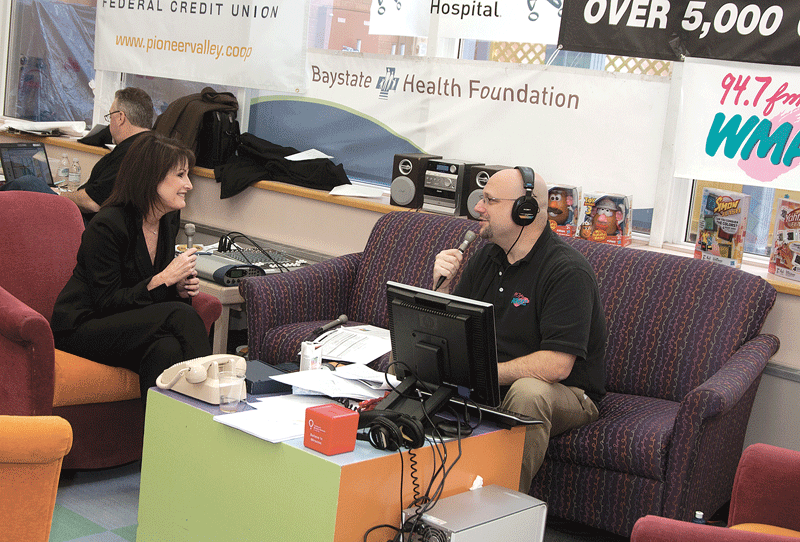 The 11th annual Radiothon was held from Feb. 16-18. Bottom, Amy Weiswasser, whose son, Alex, was born prematurely and spent time in the Davis Neonatal Intensive Care Unit at Baystate Children’s Hospital, speaks with Kellogg during the event. 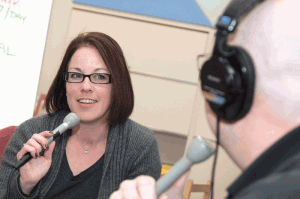 Weiswasser serves as a member of Baystate’s Family Advisory Council and NICU Parent to Parent.